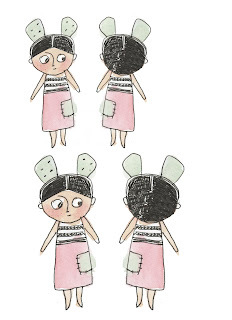 hinking of making a series of printed cloth dollies....have been thinking about it for so long now that if I don't get on with it I shall go off the idea! 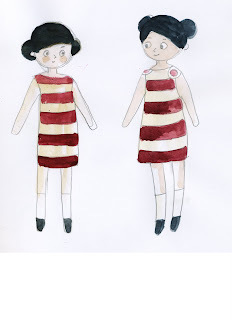 Stayed up too late last night painting wide eyed stripey dressed girls.... scanned them into photoshop and flipped them to make the back pattern. Shall sew them up tonight. We are sooooo on the same wavelength! How does that work Danielle? Do you print on the cloth or did I misunderstand that? I am wondering the same thing as Rebecka. well...the theory is to print directly onto cloth, using heat transfer paper, cut out the front and back pieces and stitch together.....I did this a few night ago, and it was rubbish!!!!! 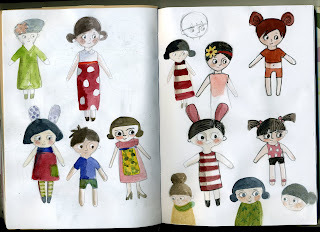 Soooo I am now making a plain doll, drawing on it with pen, unstitching it, laying out the pieces, scanning them in and redoing the artwork so that when I eventually send the artwork to sponnflower or Fabric on Demand, and they print it- when it then gets sewn up it will look right! mmm I can hear you all wondering whether it will be worth the effort!!! !